Both of our children attend Apple Tree and I can honestly say we couldn’t have picked a better nursery for them. Lesley and all her staff take the time to get to know all the children individually and it really does feel like a family. My youngest had a tendency to be a little clingy so I was worried how she would take to nursery, but I need not have worried- she adores the ladies in the baby room and loves seeing them everyday. My eldest starts school this September and although he will miss all of the staff at Apple Tree, he is very well prepared for his new adventure because of the time and effort the nursery have put into his development whilst attending. I’m happy we don’t have to say goodbye to the wonderful team here just yet! Apple Tree is a wonderful place for our child. He enjoys and looks forward to it every morning. His confidence grows everyday and brings home plenty of examples of his work as well as the daily reports on his meals and activities. 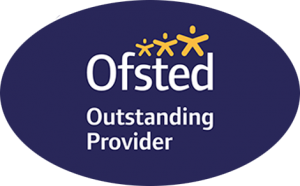 The nursery is extremely aware of their high standards and continues to develop in order to fulfil and attain their outstanding status. I feel fully confident my child is well looked after and has the opportunity to learn and grow his personality through structured activities, exploration and playing with his peers. Thank you to Leslie, Rick, and the team for offering such a pleasant place for children. My son has been going to Appletree since he was 7 months old. He now starts school in September and I could not be happier with how far he has come. He has not only learnt soo much academically but also socially. Appletree have given him the best start for school and social life! I would recommend this nursery to anyone wanting the best for their child. Since our daughter started in January she has thrived , she loves going and has a fantastic time when she is there and always exhausted after her funpacked days. It’s great reading about sher day and seeing her progression ! Overall I couldn’t rate this nursery high enough ! Fantastic !! My children have been going to this nursery for just over a month and a half now, as we had moved to a completely different area they’ve welcomed my children in to the nursery and my children are so comfortable there. My little boy attends the nursery twice a week to help him get used to not being on my hip 24/7, before he went to nursery he would cry if I left a room and now he’s running in the nursery doors happy that he’s there which is a massive thing, he loves attending with his sister and she’s such a big character and they always laugh and joke with her. I’ve seen such a change in my little boy since he’s attended and I can’t be prouder of how well he’s settled in. My little girl despite being very sensitive and reserved at times is also extremely happy to be attending and will run to nursery every day she attends telling me how much she loves it. My children are happy and as am I.